Some 25 years ago, a friend gave me a clipping from her Wandering Jew plant that she had grown from a clipping a friend had given her. I have moved this plant with me through a half-dozen moves since then, and it continues to grow in several pots around this house. It’s a survivor, thriving on minimum care. And periodically a tendril emerges (sometimes after years of compact dormancy) to reach for light and something to hold onto. Ronni Bennett, my elderblogger friend over at Time Goes By would disagree with my using the phrase “young heart. But I am partial to metaphors. 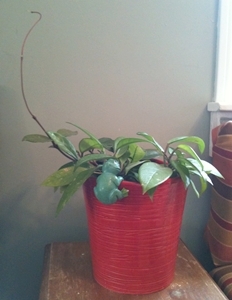 And my spring-reaching houseplant is an inspirational one for me. This entry was posted in aging, blogging, elder wisdom, metaphors, photography by Elaine. Bookmark the permalink. I used to have a virtual jungle of house plants and I always enjoyed my wandering jew — they grow like weeds!!! Stopped in to find that you haven’t stopped — yay!